June 14, 16, 20 & 22, 2018 | 7:30 p.m.
Violetta had it all—a lavish apartment, beautiful gowns and jewels, fine champagne in crystal glasses. She was a courtesan in 1850s Paris, flirting and toasting her way through life. For this pretty woman, it seemed that the party would never end. And then, she met him. 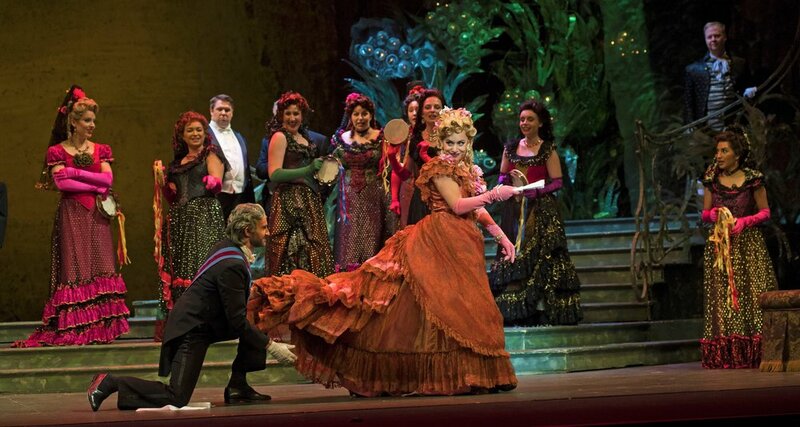 Cincinnati Opera returns home to Music Hall with a "lavish" production (Opera News) of Verdi’s irresistible classic. It’s no wonder Traviata is one of the best-loved operas of all time—filled with soaring melodies, sweeping emotions, rousing drinking songs, and passionate characters. After stealing our hearts as Liù in our spectacular 2015 Turandot, French soprano Norah Amsellem will hold the audience “spellbound” (Financial Times) as the famed courtesan Violetta Valéry. Korean tenor Ji-Min Park returns as Violetta’s lover, Alfredo, after his “beautifully sung and engagingly acted” (Cincinnati Enquirer) performance in Don Pasquale (2015). "This splendid performance…made an auspicious beginning to the season and an ideal way to inaugurate the renewed splendor…of Cincinnati’s beloved Music Hall.” Read the review. "A superb cast of singing actors, excellent conducting from the pit and seamless direction." Read the review. "Stunning...heartbreaking...You couldn’t ask for a better celebration of their return." Read the review. 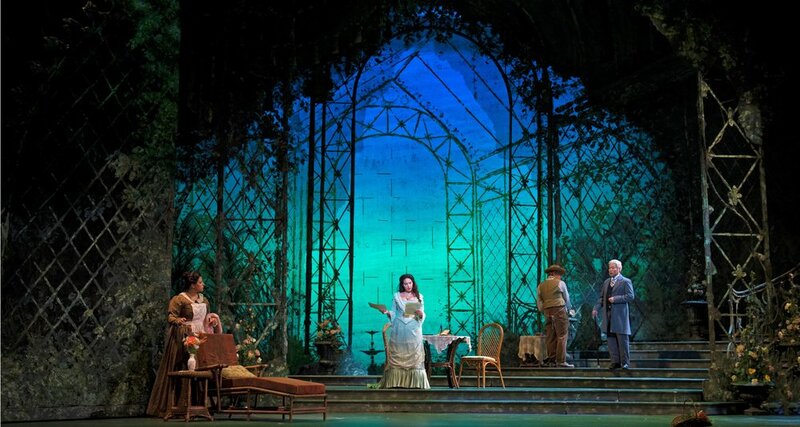 "Norah Amsellem, a stunning French soprano, would have made Verdi very happy [as Violetta]." Read the review. "At the curtain, there was a standing ovation for all involved." Read the review. "The music was so pure, so lucid and engaging... The exquisite sets, well devised stage movement, and Spanish dancing by the [Cincinnati] Ballet made for an unforgettable evening." Read the review. "Lavish and also deep-delving" Read the review. This production is owned by Lyric Opera of Chicago and is a generous and deeply appreciated gift of the Gramma Fisher Foundation of Marshalltown, Iowa. Violetta Valéry—her name is elegance itself. 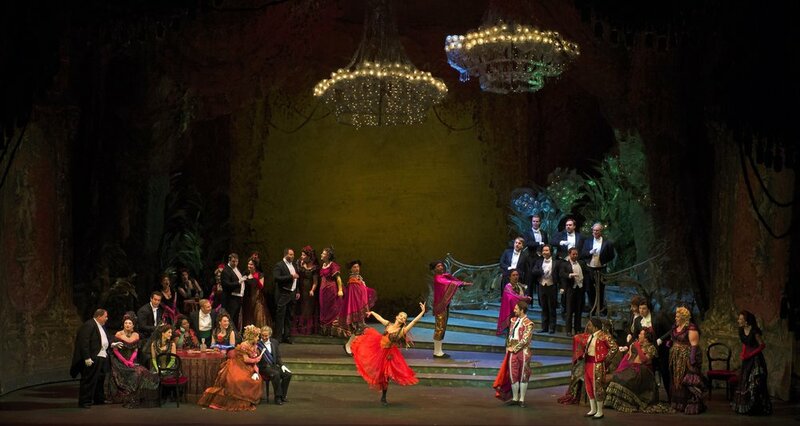 Roger Pines, dramaturg of Lyric Opera of Chicago, writes about La Traviata’s beloved heroin. Join Evans Mirageas as he interviews Norah Amsellem, acclaimed international opera singer. Amsellem starred as Violetta in our 2018 production of La Traviata. The curtain has yet to rise, but Cincinnati Opera’s 2018 season is well underway. About two dozen singers arrived earlier this month for their first rehearsals. Cincinnati writer Cindy Starr sits in on chorus rehearsal for La Traviata. Look into her eyes and what do you see? Fearlessness? Fragility? Resilience? Mistrust? Cincinnati writer Cindy Starr takes a look behind this season’s portrait of La Traviata by illustrator Tim O’Brien. Enhance your La Traviata knowledge with a pre-curtain lecture one hour before each performance in Music Hall's Corbett Tower. Evans Mirageas, The Harry T. Wilks Artistic Director, provides overviews and insights into the opera's history, music, and production. Free to all ticket holders. No reservations required. 6.14.2018 Cincinnati Refined: 41 Amazing Backstage Photos Of Cincinnati Opera’s "La Traviata"